This remote corded NI-STARTER® has a 15" cord." and a 1.5" PlugLock adapter tip and is supplied with an UL Approved 110V AC Charger. The Battery is a NiMH 3800ma cell. It locks onto the glow plug. Just push down, rotate, and it's locked for hands free operation. 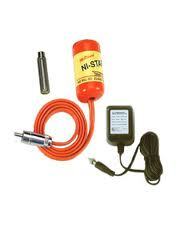 This remote corded NI-STARTER® has a 15" cord. Excellent for soft mount engines with a lot of vibration. It is supplied with a 1.5" PlugLock adapter tip. 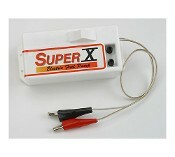 The Super "X" fuel pumps are built with a high performance centrifical pump unit to fill and empty the models tank.The Super "X” pumps have a built in directional control switch.